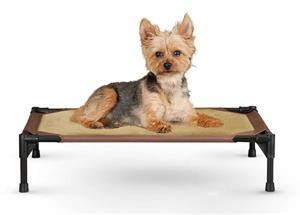 This pet cot is the perfect height to keep pets off hot or cold floors. It assembles in a snap and can easily handle the weight of any pet. Elevated pillow top sleeping area Great for small dogs or cats. It assembles without tools and has rubber non-skid feet. This unit is 17" x 22" x 7". Dimensions: 17"" x 22"" x 7""